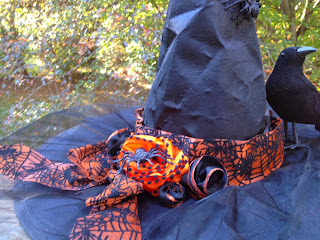 I loved the ribbons I selected- the spider webbing on the orange tulle-ish ribbon was unexpectedly velvety. It was fabulous! 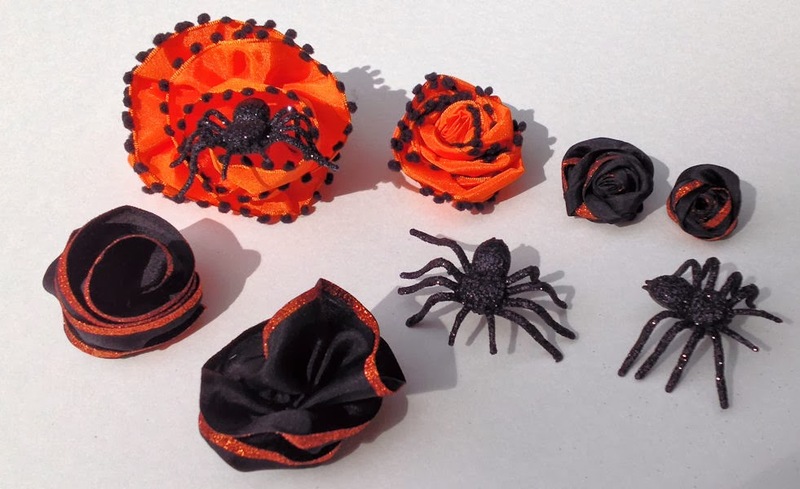 The orange satin/black pom-pom ribbon had a great, firm but flexible wire in it and was stinkin' cute. The black was a bit looser than I expected but made gorgeous flowers. I picked the hat up at Joann's last year- I absolutely loved the tulle hanging from it. It originally had 2 silver satin flowers attached to it but I cut them off in order to decorate it with the May Arts ribbons. First I wrapped the spider web ribbon around the base of the hat. I considered trying to somehow attach the top edge of the ribbon to the hat so that it followed the conical shape but in the end, I liked it pulled away a bit at the top. 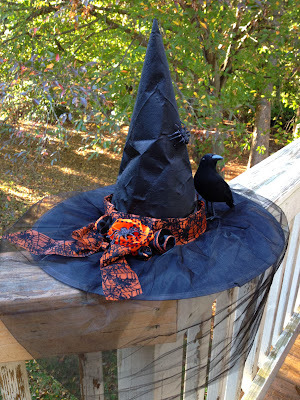 I doubled this ribbon over, matching the pattern, so that the orange was a bit brighter against the black of the hat- I really wanted it to stand out. There was enough left over that I was able to make a bow with hanging ends. I used the orange pom-pom ribbon to make a gathered flower and a twisted rose. The gathered flower is large enough that I put a spider I glittered into it. I also glittered the edge of the black ribbon with some sticky strip tape and fine orange glitter. There was enough of the ribbon that I was able to make two of each of the gathered flowers and roses. On the gathered flowers, I pulled the ribbon a bit differently and you can see the two different results in the large black flowers. I'm happy to say that I used all of the ribbon in its entirety. 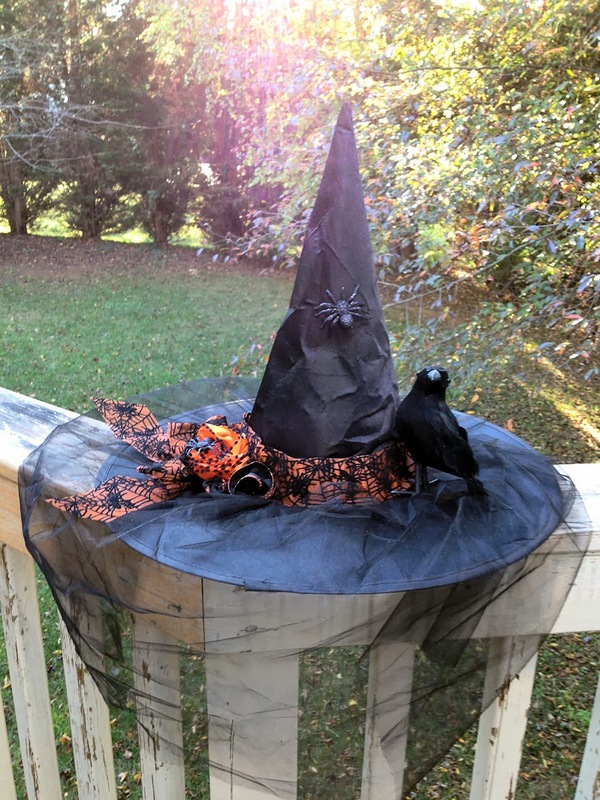 I hot glued everything to the hat and added two more spiders and a crow to finish the look. Yes, the crow is attached. The wire in his feet was actually enough to punch through the hat and keeps him upright. I'm looking forward to wearing this on Thursday to the Halloween party over at our Taekwando school! To see all of the entries, head over to the May Arts blog. Hey Girlfriend! You've done some revamping to your blog I see... I love it! That photo of you and your son is totally adorable, what a cutie pied (both of you) :D And I so want one of those hats... wonder if JoAnn's has them this year... maybe I'll take a ride into town to check. You're right, that tuille completely makes that hat. Great project my sweet friend!